Crystal Singing Bowls create a ‘pure’ sound. The history of singing bowls dates back before the Buddha, Shakyamni (560-480 B.C.) . The vibration of the bowls is like the primal voice of the once quiet universe. How does it work? Whether in a group session or in a private session the sounds of the bowls create a healing environment because we are energy and they are vibration. Think of it as if you were a still lake (since we are made up mostly of water this makes sense) and we throw a pebble into the middle of the lake creating a visible vibration from that center point all across the lake; the vibration and music from the bowls is the pebble. Whether you are experiencing an emotional issue, a physical dis-ease or are in need of a calming moment, crystal bowl therapy can help you. 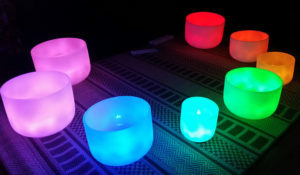 A bowl session combines color and sound to help you release energy blockages and begin your healing transformation.